Two 13-meter antennas, which were constructed for satellite communications and broadcasting experiments in the mid-1970s, have been dismantled in Kashima Space Research Center of NICT. President Takashi Yabashi talks about B-SAT's BS broadcasting services, BSAT-3 and the next BSAT-4 satellites, control and management systems as well as stable operations by an uplink compensation technology. "Innovation in Telecommunications �] The Perspective of a Satcom Terminal Developer"
"An often overlooked requirement is that innovation also requires great (or even heroic) customers - customers who seek the rewards of innovation but still have the risk appetite to be able to fund and trial innovations that might run late, be over budget, or that do not fully meet specification!" In AIAA ICSSC-2015, which was held in Gold Coast of Australia from September 7 to 10, 2015, Dr. Rowan Gilmore has worked hard and well as the General Chair. He makes an excellent comment about innovation in telecommunications. As an executive management at SSL, Chris Hoeber accomplished a great job to make his company the world leader in communications satellite manufacturing industry until he retired a year ago. Here, he looks back some early history of the first SSL1300 satellite �gSuperbird-A�h as the Japan/U.S. joint program, as well as the legacy story which Superbird left for the following programs. Michael M. Lewis:"Flash Boys; A Wall Street Revolt", Writers House, 2014. Development of World's First LED Visible Light Communication Experimental Satellite "Ginrei"
Atsushi Nakajima, Former Project Manager of the Ginrei Program and a Professor at Shinshu University, Japan. World Radiocommunication Conferences (WRC) are held every three to four years to review and revise the Radio Regulations, and the international treaty governing the use of the radio-frequency spectrum and the geostationary-satellite and non-geostationary-satellite orbits. WRC-15 was held in Geneva, Switzerland from November 2 to 27, 2015. This paper reports how the Radio Regulations have been revised mainly from space related viewpoints. The 21st Ka and Broadband Communications Conference was held in Bologna, Italy on October 12-14,2015. The next conference co-organized by AIAA ICSSC will be held in Cleveland, Ohio, on October, 17-20, 2016. Abstract Due: April 30, 2016. 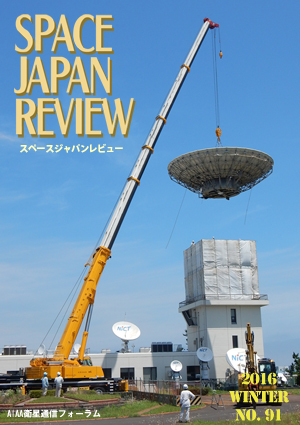 The 16th Japan-Korea Joint Conference on Satellite Communications (JC-SAT2015), which was held in Osaka, Japan on October 7-8, 2015, is reported in this paper. Dr. Akio Iso talks about expected roles of satellite communications in Ku and Ka bands together with an Unmanned Aircraft System (UAS) during natural disasters such as a volcanic eruption.